The press is like the peculiar uncle you keep in the attic – just one of those unfortunate things. Obviously crime pays, or there’d be no crime. 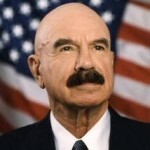 George Gordon Battle Liddy was born in Brooklyn, New York city, New York, USA. He is a retired American lawyer who is best known as the chief operative in the White House Plumbers unit that existed from July–September 1971, during Richard Nixon's presidency. He was convicted of conspiracy, burglary, and illegal wiretapping for his role in the Watergate scandal. From 1992 to 2012 he served as a radio talk show host. He graduated from Fordham University in 1952. After graduation, he joined the United States Army, serving for two years as an artillery officer during the Korean War. He studied law at Fordham University School of Law. After graduating from law school in 1957, he went to work for the Federal Bureau of Investigation under J. Edgar Hoover. He resigned from the FBI in 1962 and worked as a lawyer in New York City until 1966. In 1968, he ran for the United States House of Representatives in New York's 28th congressional district. He acted in several films, including Street Asylum, Feds, Adventures in Spying, Camp Cucamonga, and Rules of Engagement. He appeared on such television shows as The Highwayman, Airwolf, Fear Factor, Perry Mason, and MacGyver. He has written several books include: Will, When I was a kid, this was a free country, The Monkey Handlers, and Out of Control(novel).